As I've mentioned before, lucky Kim gets to celebrate Father's Day twice a year. First up in June for American Father's Day, and secondly in September for Australian Father's Day. Unfortunately Australia and America share the same date for Mother's Day so I only get one special day. Boo. This year I've been so busy with visitors, vacations and back to school that Australian Father's Day sneaked up on me. With no barrage of ads for power tools, barbecues, electronic gizmos and socks on tv it completely slipped my mind until a few days ago. Sorry Grandpas in Australia, your cards will be a little late. Nothing unusual there though! If you've seen the previous Father's Day cards that I've made with the girls you'll know that I'm fond of coming up with something cheesy. There was the giant redwood themed "Tree-mendous Father's Day" card from last year, and the baseball themed "Number 1 Fan" cards from the year before. This year is no different with another cheesy caption. I can't help myself. I think I have a problem! Lately Kim has been a little obsessed with wearing hats. And the girls are obsessed with wearing Daddy's hats when they can get their hands on one. With this new obsession and a cheesy catch line in mind the girls and I set about creating a card involving Daddy's hat collection. See? I told you it was cheesy! First up we needed a photo of the girls wearing Daddy's hats. As luck would have it Kim happens to own three hats which suit the girls' hair colour, eye colour and skin tone perfectly. A light brown panama for Ava's dark blonde hair, a pale blue trilby to go with Lola's icy eyes, and a darker hat to match Mathilde's brown hair (which will likely turn blonde like her older sisters' hair did) and darker eyes (which seem to be turning brown). As you can imagine, Daddy's head is a little bigger than the girls' heads so the hats were a little big too. Ava and Lola wore theirs on jaunty angles to keep them from covering their faces. We gave up with Mathilde's and just let it cover her whole head! 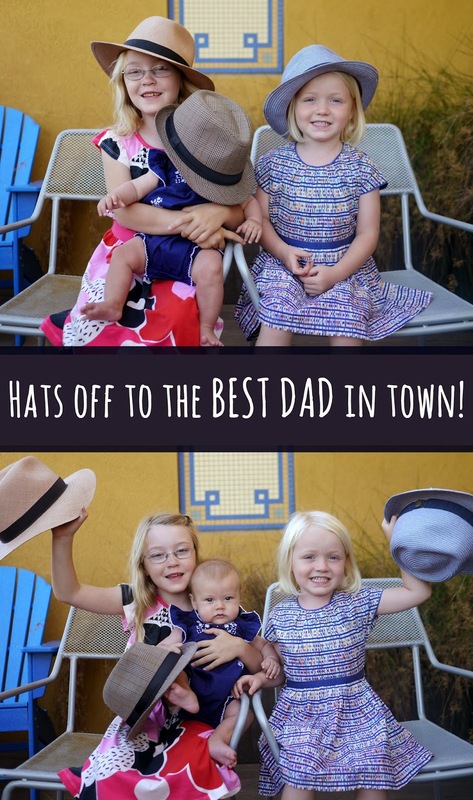 As my cheesy caption was to say "Hats off to the best Dad in town" the girls needed to take their hats off as well. I thought about having the girls throw their hats in the air in celebration, graduation style, but Ava was really worried she'd accidentally throw hers off the roof of our building where we were taking the photos! Very unlikely but I guess not impossible! I was more concerned with how hard it would've been to coordinate the girls throwing their hats at the same time and how Ava would do so while holding Mathilde. Plus Mathilde hasn't quite learned the skills required to throw a hat in the air! She can hold onto the brim though so instead I had the girls hold their hats up. Much easier. I stuck my favourite shots together in photoshop with the cheesy caption and, voila, this year's Fathers Day card was done. Hats off to all the wonderful Dads out there celebrating Father's Day today!